Happy Friday everyone . . . the weekend is on it's way (time whizzes past way too fast for me nowadays - age, I suppose). 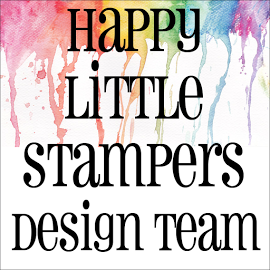 Anywho, my card today is another for Loll & Bonnie's CAS Mix Up Challenge which states that you need to use, stamping, stencilling and whatever you choose yourself . . . and, of course, it needs to be CAS. Again, I will show the card first and then describe how I made it below the pictures. The first thing I did was to make a watercolour panel with three different blue inks by blending, drying and finally water-marking with water. Then whilst that was drying I took a white card base and a stencil and spread a little white embossing paste on to the left hand side of the card, because I knew I wanted to put my focal piece to the right, then I let that dry. When the watercolour panel was dry, I ran it through my Big Shot with a stitched tag die. Then I used a hole punch and made a hole in the top of the tag. 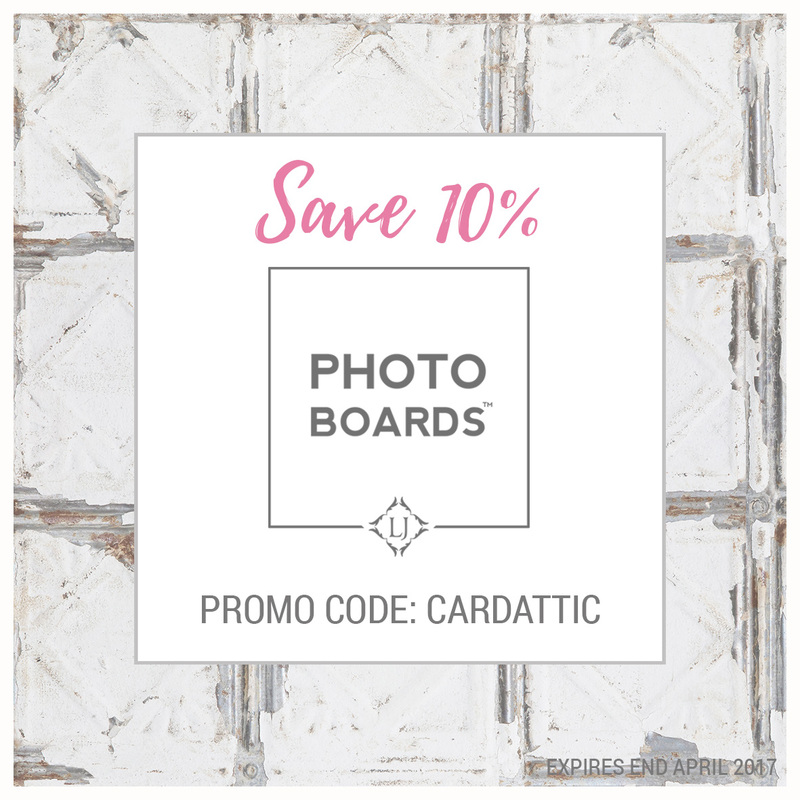 The next thing I did, was to stamp in Versamark an image on to the tag with a Stampin' Up stamp from the 'Garden Silhouettes' set and heat emboss in white. Then I made a 'tassel' with some twine and attached it to the tag. I adhered the tag to the card base with foam tape, cut a 'thanks' die cut out of foam and a piece of white card and mounted that to the tag to finish! That's it for today my friends! Have a very lovely weekend! I love that blue background, there's just so much texture to it. Beautiful white details, I especially like that great tassel! 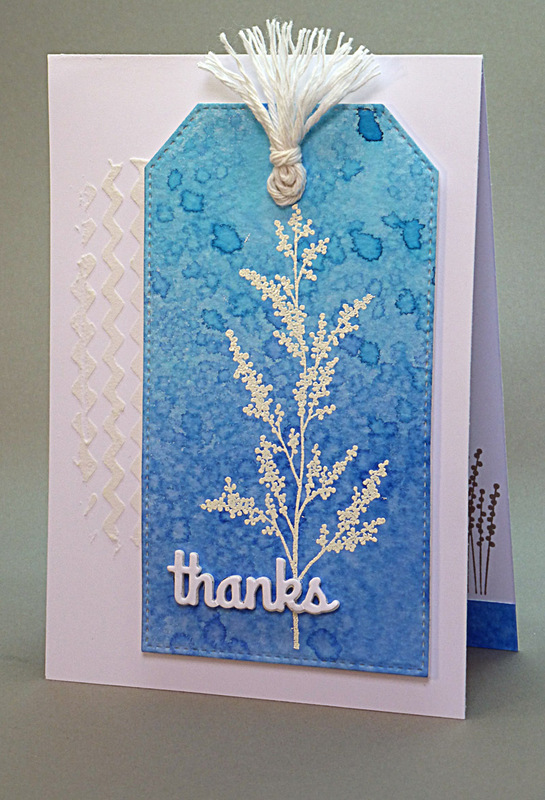 the embossed stencil background is perfect for you pretty blue tag - and the tassel is such a great touch! 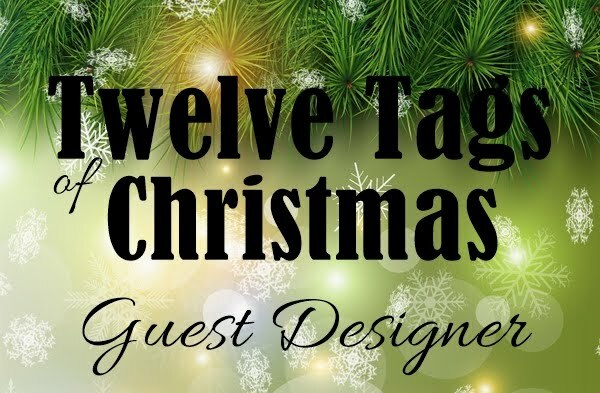 What a beautiful watercolor tag, Hazel! 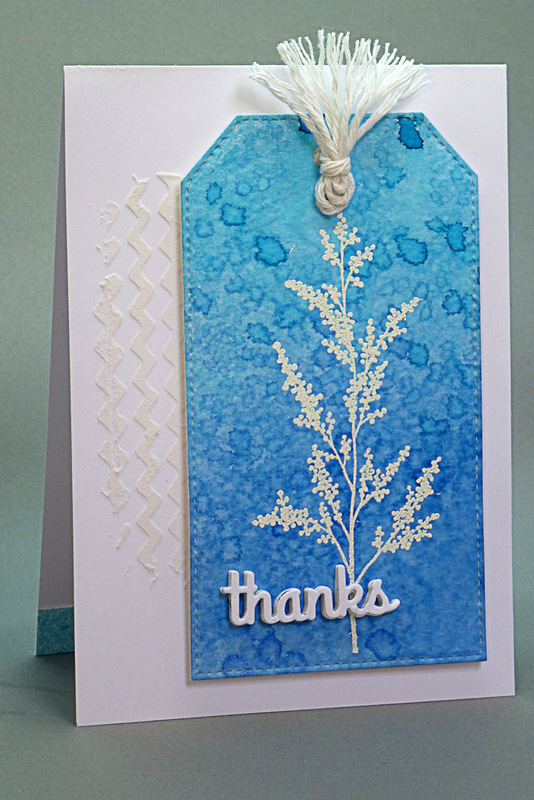 Your water drops add so much interest and so does the subtle stenciling beside the tag! A whole lot of awesomeness here, my friend! Thanks so much for sharing it with us at CAS Mix Up! Oh my Hazel I so love this, thanks for your explanation too. There is so much here to love :) The watercolored background is so bright and vibrant and I love that you flicked a bit of water on it to give it a textured look. Then the white embossed stem and the white die cut sentiment just jump up and says "look at me!" The embossing paste and the cool tassle just finish this off perfectly for me. What a beauty! Truly a lovely card, Hazel. Love that blue background and the additional texture you added with the embossing paste. Have a great weekend. I do so love this card. 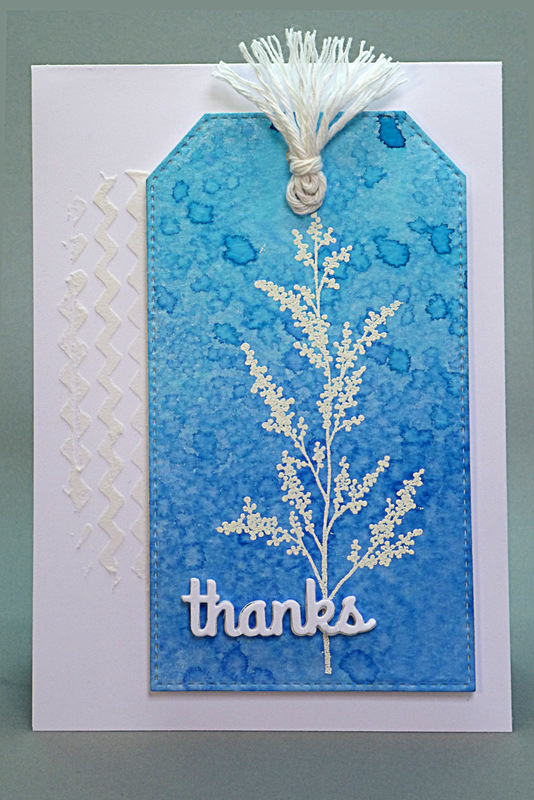 The colours are fabulous and loving the water coloured/blended background. The stenciling sets it all off beautifully. 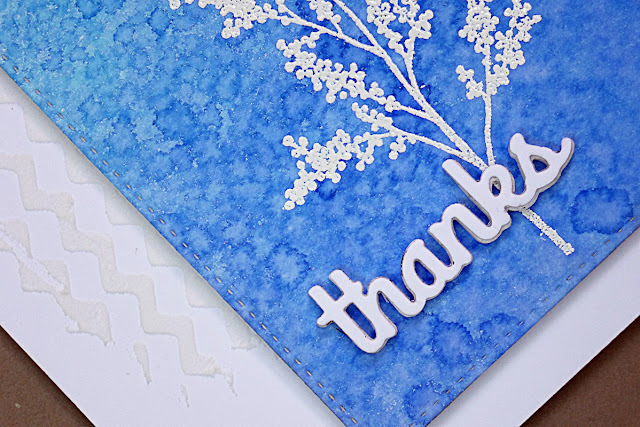 Beautiful card Hazel...what an incredible back drop for you white flowers, that blue is amazing. Oh, I love that cute little tassel, Hazel!!! The watercoloured tag is really beautiful with the white embossed image on the lovely blues!!! And I love the bit of texture from the stencilling with the embossing paste!!! So beautiful, my friend!!! This card has such an interesting look due to the varied techniques used. Love this look! Such a beautiful SU image, Hazel. How come you never run out of craft room?? ?